Let me start with; German grammar is really not that bad. It’s actually rather nice in terms of word order because the case morphology allows more word order possibilities than, say English (which lost a great deal of it). But let’s focus on the verb position that Richard was questioning. In simple sentences, the word order is SVO, just as in English. For example “Ich trinke Wasser” ‘I drink water’. So the conjugated (finite) verb is in the second position (not necessarily second word: “Die zwei bösen Männer klauen Geld” ‘the two bad men steal money’ – all translations are literally). When you’re dealing with a compound verb, the first part of the verb phrase is in the second position and the second part (either past participle, separable prefix or infinitive) is in the final position. For example: “Ich werde morgen singen” ‘I will tomorrow sing’. For emphasis, the sentence can start with something other than a subject (“topicalization”), which then comes straight after the verb. No matter what begins the sentence, the verb is always in the second position. For example: “Wasser trinke ich” – ‘water I drink’, “Geld klauen die zwei bösen Männer” – ‘money steal the two bad men’, “Morgen werde ich singen” – ‘Tomorrow will I sing’). The only cases where the verb doesn’t follow this “second-position-rule” and the word order changes to SOV are in dependent or subordinate clauses. For example: “Das ist Richard, der viel im Internet schreibt.” ‘This is Richard, who much in the Internet writes’, “Ich tanze, weil ich Tanzen mag” ‘I dance, because I dancing like’. The classification of German is a little tricky because the verb often consists of two parts that are found at different positions in the sentence (second and last respectively). In subordinate clauses, the subject and verb have a fix position and the parts of the verb cannot be separated (say it was a separable verb such as “anfangen”; in a main clause it would be separated, as in “Ich fange an” – ‘I start’, but in a subordinate clause it wouldn’t, as in “Ich will, dass wir anfangen” – ‘I want that we start’). So frequently the word order of the subordinate clause is taken to be the basic word order, classifying German as an SOV-language. Nice post. That was the phenomenon and the theoretical description I was referencing, although I of course could not have put it so eloquently. I still think this might have some implications for how we define linguistic typologies. True. Quoting wiki: …linguists base the typology on the non-analytic tenses (i.e. those sentences in which the verb is not split) or on the position of the auxiliary. (German is thus SVO in main clauses)… Many typologists classify German as V2 language, as the verb invariantly occurs as the second element of a full clause. as for me, I would classify German as an SVO language – if typologists classify languages that allow a variety of orders according to the order that is most common, why not do the same with German (and Dutch (and Welsh…))!? 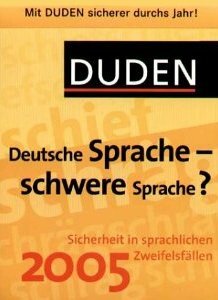 This entry was posted on 23/01/2011 by G in Academia, Cultures, Linguistic Musings and tagged German, grammar, linguistics, SOV, SVO, word order.